Frugal & Fabulous: Review: The Soothing Company! Looking for a cool place to buy a unique gift? The Soothing Company is a website that offers hundreds of soothing products for your home or garden. They even have a website, Soothing Walls, that offers a large selection of Outdoor water fountains. But they don't just sell fountains and bird baths! They have everything from bean bag chairs and foam furniture to fireplaces and mattress toppers. They even sell saunas! It's your one stop shopping destination for anything soothing/relaxing! The tree I received was a Dwarf Jade Indoor Bonsai Tree. 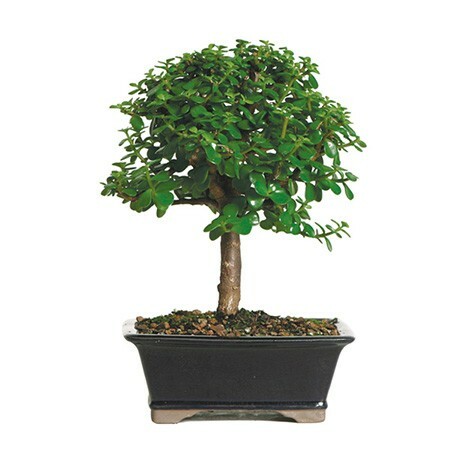 This tree is an easy to care for bonsai that requires little light and water and is very easy to grow. My tree looks gorgeous on my living room bookshelf and I love looking at it everyday! I have gotten a lot of compliments on it in the past couple weeks, and my cats have yet to try and eat it which is always a plus!!! The tree came just as pictured above, in a beautiful blue pot. It is a very elegant plant that would look right in just about any room in the house. Verdict: I love my new Bonsai tree and may even be purchasing another one soon! The Soothing Company is a great place to order gifts for yourself or others and their shipping is quick and efficient. I always worry about receiving live plants or flowers in the mail, but this tree came very tightly packaged and was unwrapped in perfect condition! Buy it: Bonsai trees sell from $35+ and if you enter your email on their website you'll get a coupon for 10% off. Shipping is free! Have you ever cared for a bonsai? Let me know!